The richness and sophistication of Abu Dhabi can talk endlessly – it is the main city of the UAE, its capital and richest emirate among all the others. 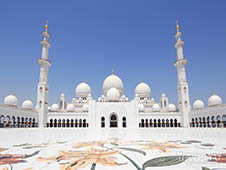 Travellers and visitors to Abu Dhabi expects the rest of the corresponding – a respectable level. All the most interesting places and attractions are concentrated on the island of Yas called. He is familiar to fans of motor rest, since it is here is the track for F1 racing. Hotels in the 4th and 5th star on the coast and in the city center, a few dozen of the largest shopping malls, open markets for those who can not live without the chic shopping. Fans of excursions and various attractions interested in nature reserves, the palace of Al-Dzharaf, oases. In short, bored idleness in Abu Dhabi is not necessary. What better way to explore the city on your – rent a car at the airport or the center of Abu Dhabi? Make yourself comfortable rest using bookingcar.ru. In the UAE, as the currency used dirhams (current rate - 1 dirham = 0,27 USD). It is the police traffic violations seriously, requests can not be violators, and the outcome of all accidents is solved directly on the road. Of all the emirates of Abu Dhabi allocated the largest fines. In the city a lot of toll roads. To travel on a road you must make a payment at the entrance (indicated by a large arch). The average cost - 4-5 dirhams. Local drivers use special cards for travel and foreign drivers have the opportunity to apply the ordinary credit card. The maximum daily payment for travel on the toll road - 25 dirhams. If the interval between the passages under the arches is less than an hour, the second time you can not pay. The city is allowed to move no faster than 60 km / h.
If on your way there was a sign of 120/140, it is interpreted as follows: the maximum speed on the current line - 120 km / h, and in the whole country - 140 km / h.
The least number of vehicles on the city parking is observed between 13:00 and 16:00, but sometimes the search space is hampered by the fact that the local population uses the lunch break for shopping and cafes. Parking is prohibited on sections of road with red markings. Improperly parked cars are sent to the penalty parking, and their owners receive large fines. Abud Dhabi, as well as any other city in the UAE, is characterized by relatively low price policy with respect to filling of fuel. Thus drivers of leased cars in Abu Dhabi pleasantly surprised by the high quality of gasoline. The cost of fuel at all gas stations kept at approximately the same level. Self-service at gas stations is not provided. Their employees provide customers with complete service from fueling the vehicle before washing windows, checking the tire pressure. And the last two procedures are completely free of charge. 1 liter of diesel fuel - 0,79 USD.